All winter long, vegetables are oven roasted to bring out their flavour. Throughout the summer months, no dinner is eaten that hasn't passed over the grills of the barbecue. Spring however, is this funny in between season, where vegetables are eaten every which way. This salad satisfies all the spring cravings - simple produce, ample crunch, varied textures and a tasty dressing. 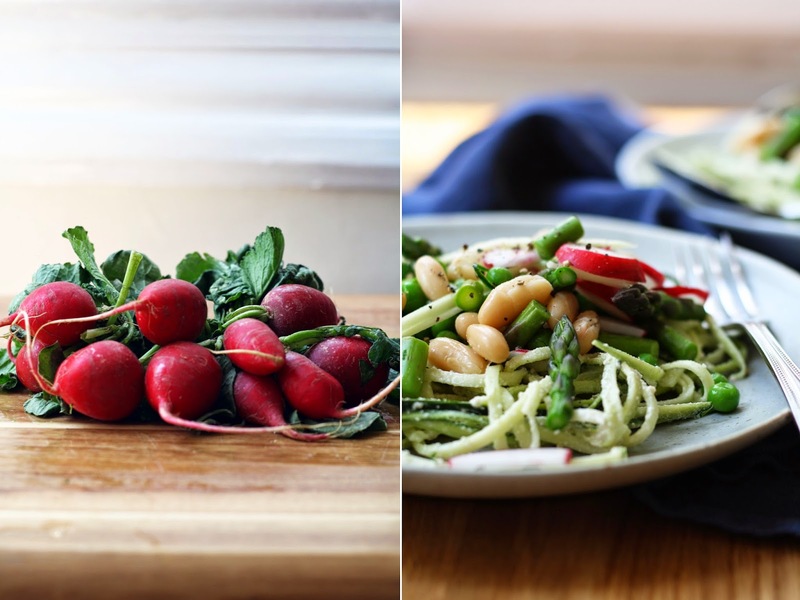 There's a few other spring inspired dishes that I'm itching to try: potato, asparagus & lentil salad; spring chopped salad; grilled caesar salad; asparagus, pea and broccoli saute; and spring greens with chili and mint. Combine the cashews and sunflower seeds in a small bowl. Cover with water and let sit for 2 hours. Set a small pot with a steamer insert on the stove. Bring to boil and drop the asparagus and frozen peas inside. Steam for about 5 minutes, until cooked through yet still crunchy. Strain and transfer to a large bowl. Add the beans and radishes, toss with juice from half a lemon, salt and pepper and set aside. Using a julienne peeler, prepare your zucchini noodles. The longer the zucchini, the longer the noodles :). Transfer to a large bowl and set aside until your nuts have soaked for 2 hours. When the nuts are ready, you can prepare the dressing. Drain the nuts and transfer to the body of a bullet or blender. Add all the remaining dressing ingredients except for the dill. Pulse until a smooth dressing is formed - add more water if need be. Drop the dill into the dressing and stir to combine. Dress the zucchini with all the dressing. 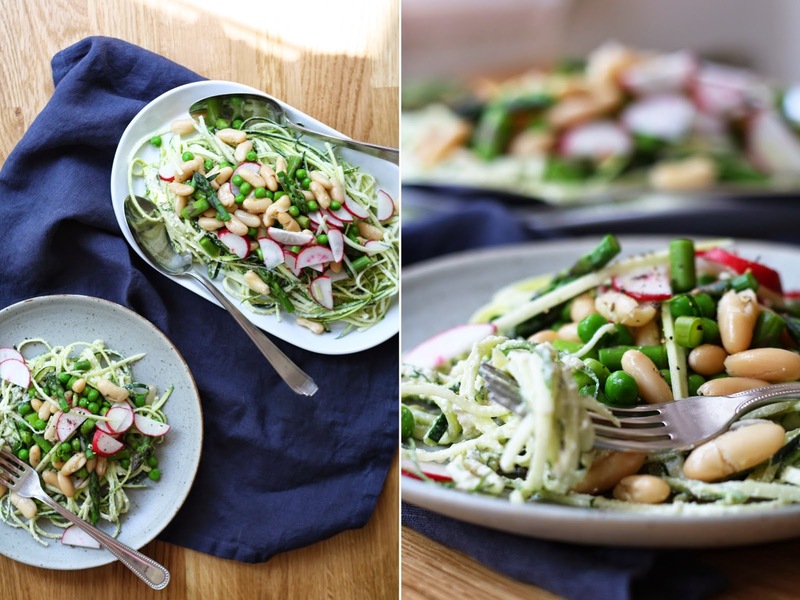 When ready to serve, plate the zucchini noodles and top with a heaping spoonful of veggies. Finish with a squeeze of lemon juice and a decent dose of fresh cracked pepper.